As a former college offensive linemen, I’m well aware of the reputation that holding penalties have – ‘you could call one on every play’ goes the old adage. Kevin and I wrote a paper, recently appearing in JQAS, in which we looked at the rates of NFL penalties. Specifically, we wanted to address how rates fluctuate over the course of the game. Quick summary: the rates of discretionary penalties in NFL games are hugely correlated with time. 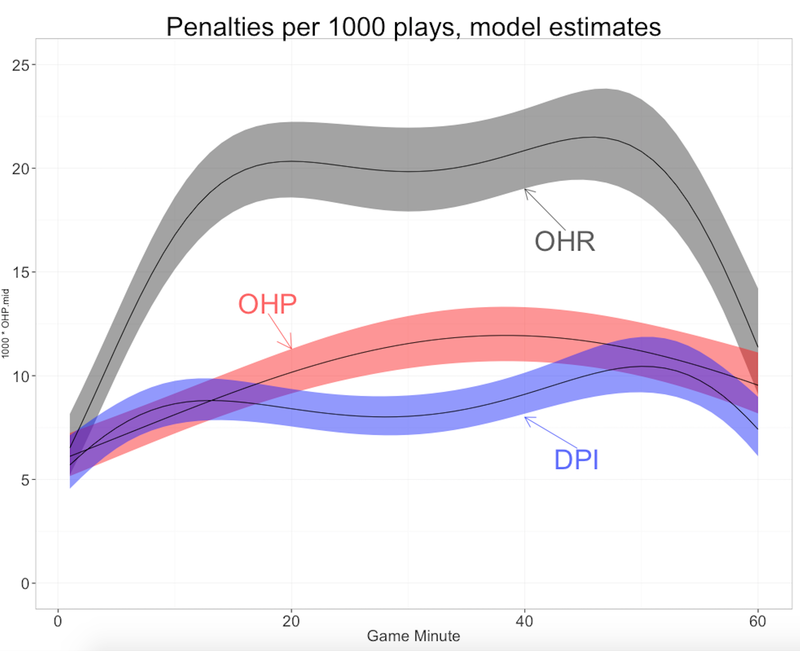 Here’s my favorite plot, where, letting OHR be the holding rate on run plays, OHP the holding rate on pass plays, and DPI the defensive pass interference rate, we compare versus game minute (1 through 60). These rates are adjusted for play and game characteristics, and given per 1000 plays along with 95% confidence limits.